SPACE STILL AVAILABLE! BOOK NOW!! THIS FUN, INTERESTING,ALL-INCLUSIVE TOUR (DELUXE COACH BUS, SNACKS, LUNCH, AND MORE) AT $30 PER PERSON IS A REAL DEAL!! SUNDAY, NOVEMBER 4TH: BUS TOUR OF THE D&R CANAL FROM BULLS ISLAND TO TRENTON - Join us for a fabulous "on/off" walking tour of the D&R Canal. We will be hopping on and off a deluxe coach bus with private comfort facility for a day walking the scenic and preserved Delaware and Raritan Canal system from Bulls Island State Park to Trenton. Built in 1834 and dug with hand tools mostly by Irish immigrants, the canal starts in New Brunswick and ends in Trenton, which we all know by now was once part of Hunterdon County. The canal was the major shipping hub of West NJ commerce. It has a fascinating set of locks that allowed boats to be raised and lowered. Our day starts at 9 am when we will meet at the Bulls Island State Park parking lot closest to Route 29. (Do not go over the bridge.) We will spend about an hour learning the history of the canal and walking the Bulls Island section of the Canal with our guides Bob and Linda Barth. Linda is the president of the D&R Canal Watch and has literally spent her life on this canal. At 10 am we will depart in our deluxe coach and head to the beautiful and preserved Prallsville Mills where Linda and Bob will provide a tour of the grist mill and canal-related sites. The Prallsville Mills is home of the D&R Greenway Commission. We'll make a brief stop to see the canal aqueduct near the Holcomb-Jimison Farmstead Museum, the oldest farm in Hunterdon County. Our next stop is in Lambertville to see the lift lock and the outlet lock. We'll stop for a nice lunch and head out of Lambertville and "2018 Hunterdon County"and then head to "18th Century Hunterdon County" for a stop at Washington Crossing State Park, once ours -- now Mercer County's -- to view the ferry boat reproduction of an 18th-century ferry located there. From there we head to Trenton to view the Battle Monument and take a short walk to the confluence of the main canal and feeder in Trenton. Return time to Bulls Island is approximately 4 pm. In honor of the 100th anniversary of the Armistice and ending of the Great War in 1918, Marcia Karrow will present a talk about the recruitment of Hunterdon's World War I's soldiers and the Red Cross movement in Hunterdon County. Free. Reservations recommended. Refreshments follow. 2 pm. Main Branch Hunterdon County Library. TUESDAY, NOVEMBER 13TH: 'UP A CREEK' IN HUNTERDON COUNTY: CROSSING WATER EVERYWHERE! : ‘Without a paddle’ or with one... either way this program presented by Marilyn Cummings includes the various 18th & 19th-century methods for getting from Point A to Point B without getting wet (well… not too wet)! It covers such topics as fords, ferries, and bridges [stone arch, metal truss, covered bridges] as well as watercraft that were used to navigate our waterways in Hunterdon County B.C. [before cars]. A fun program for adults and students alike that draws to a close our ‘Water, Water Everywhere’ theme for the year. 7 pm Main Branch; free. refreshments follow. SUNDAY, NOVEMBER 18TH: AN AFTERNOON AT THE MOVIES: "THE TOWN THAT DISAPPEARED OVERNIGHT": Join us as we bring back this Emmy Award nominated documentary about the creation of Round Valley Reservoir and the taking of some of the best agricultural land by the State of NJ. The film's producers, David Kuznicki and Eric Althoff, along with County Historian Stephanie Stevens will be on hand to answer questions. Main Branch of the County Library. Reservations required. Free with free Refreshments. Please reserve either the 1:30 pm or the 3:30 pm showing. AND NOW IT'S TIME FOR A SPECIAL ANNOUNCEMENT: The Towns that Disappeared Overnight's producers, David Kuznicki and Eric Altoff are planning a new documentary on another Hunterdon history topic: the Jutland Massacre. Some of you may know the story: the early 1930's, a neighbor making a complaint about possible mistreated farm animals, the ASPCA and the State Police raiding the family's home; a shoot out; a death. This story riveted the national press as the NJ State Police were put on trial for murder in Hunterdon's historic Courthouse. It was such a huge story across America that the only thing that knocked it off of the front pages was the kidnapping of the Lindbergh Baby and trial of Bruno Hauptmann, also right here in Flemington! The Hunterdon 300th is proud to announce that we are partnering with David and Eric in bringing this film to reality. As David says, "Few things are as important as curating local history. It is an awesome responsibility and one that I'm both excited and proud to undertake." If you or anyone you know have memories of the event or trial or memorabilia from it, please contact us at 300info@co.hunterdon.nj.us. DVDs of The Town That Disappeared Overnight will be available for sale on November 18th and all proceeds from the sale will be used to start this project. If you are wondering, a project like this will cost in excess of $20,000, so every little bit helps! You can see more about the work of these two filmmakers on their Facebook page https://www.facebook.com/Media523 and you can also subscribe to their Media 523 YouTube channel where they will be posting snippets and extra footage of the show as it gets further into production. 11 AM TO NOON: Teacher and Historian Janice Armstrong will be with us for CHILDREN'S HISTORICAL CRAFTS AND GAMES: Corn Husk Toys, Lenape Medicine Pouch and more…. your children can create a toy out of cornhusks just like children would have in the 1800’s. They can make their own Lenape Medicine Pouch to fill with tiny treasures. For children ages 6-12 years old. FREE. 2PM TO 4:15 PM: MOVIE SHOWING "IT'S A WONDERFUL LIFE": Following our festivities, join us for a special holiday showing of "Its a Wonderful Life" starring Jimmy Stewart and Donna Reed in Frank Capra's classic. "Water, Water Everywhere" indeed! -- this classic film opens up with our hero pondering if his life is worth living on a historical truss bridge over churning water in a small town called Bedford Falls.... The inspiration for this was our very own Califon Borough and their gorgeous, restored historic truss bridge! The villain of the story, Mr. Potter, creates a depressing vision of a residential development called "Pottersville" -- perhaps taken from nearby Potterstown.... Free hot chocolate, lemonade and treats will be available. FREE. This new exhibit highlighs the radio, one of the most important inventions of the 20th century. A collection of antique and vintage radios is on loan to the Museum from collector and radio enthusiast Michael Molnar, who has been collecting for over 30 years. He has co-curated this very special exhibit which traces the evolution of radio and shares stories of the cultural impact it had on society. NOW ON DISPLAY... IN PENNSYLVANIA! Our great friend and favorite Vexillologist, Richard Pierce, has curated a new exhibit. Although the exhibit is across the river in New Hope, Richard is pure Hunterdon County!! You can see some fine American flags from Richard's collection in the Eastlake Room of the Parry Mansion located at 45 S. Main Street, New Hope. Richard Pierce has assembled an extraordinary collection of rare and important flags that has been displayed in museums throughout the country. The exhibit is ope to the public on Saturdays and Sundays from 1 to 5 pm through November 18th. Meeting Times and Location/Directions: Tailgate sales in the parking lot begin at 12:00pm (as we always say, you may want to get there earlier than that!). The meeting itself starts at 1:00pm and runs until 3:30pm. It is held at the...Masonic Lodge, Ridge Road & Dennis Ave, High Bridge NJ 08829. SUNDAY, NOVEMBER 4TH: HUNTERDON HISTORICAL SOCIETY PRESENT THEIR FALL MEMBERSHIP MEETING AND LECTURE - FREE AND OPEN TO THE PUBLIC: "For Citizens and Strangers: New Jersey Taverns During the Early American Period": Architectural historian Dennis Bertland is the guest speaker at the Society’s fall meeting on Sunday, November 4, 2018 @ 2:00 p.m. The meeting and lecture will be held at the United Methodist Church, 116 Main Street in Flemington, directly adjacent to the Historical Society Library and headquarters. The presentation on tavern history in colonial America by Mr. Bertland is based on the extensive research that he conducted for the Merchants and Drovers Tavern Association. The findings were used for an interpretive exhibit at its tavern museum in Rahway, New Jersey. The exhibit script and book based on his research and authored by Mr. Bertland, is pending publication. Over his forty-year career, Mr. Bertland has studied and written extensively about New Jersey’s early architecture. His firm, Dennis Bertland Associates, is based in Stockton, New Jersey and specializes in historic preservation. The talk will last about 50 minutes, followed by questions; refreshments will be served. 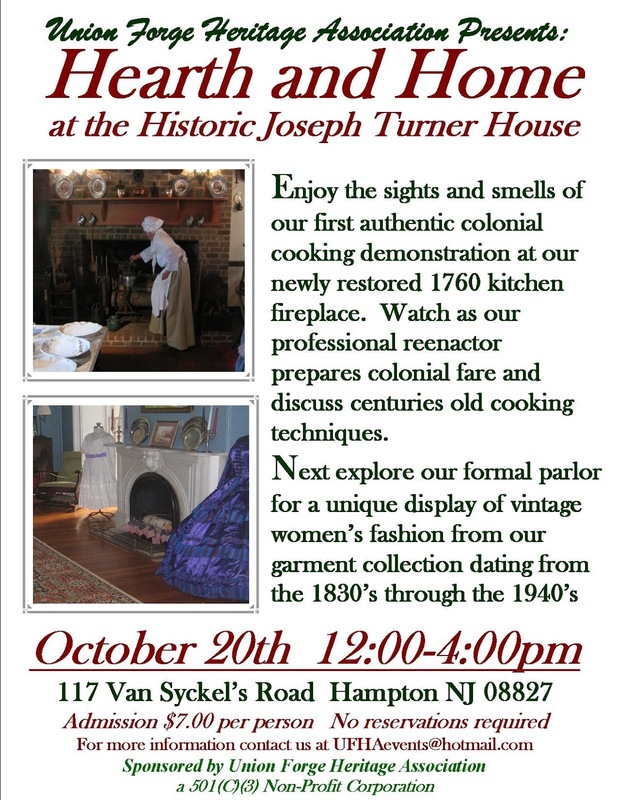 SUNDAY, NOVEMBER 4TH: READINGTON MUSEUMS SMOKEHOUSE DEOMONSTRATION:Susan McLellan Plaisted MS RD CSP LDN, will demonstrate and discuss methods and traditions for smoking pork during the 18th century. At that time, most homes had a smokehouse in their backyard, and the Bouman-Stickney Farmstead has become no exception. Thanks to Eagle Scout, Derek Scott, the farmstead is proud to showcase his recent Eagle Scout project, the smokehouse, as Plaisted demonstrates the art of smoking meat. 1pm - 4pm. SATURDAY, NOVEMBER 10TH: BUS TRIP TO THE MUSEUM OF AMERICAN REVOLUTION, PHILADELPHIA, PA: The Raritan Township Local Historians Committee is hosting a trip to the Museum of the American Revolution, Philadelphia, Pa. on November 10, 2018. The cost for each attendee is $55/person. For Veterans. Gold Star family members, and active duty service personnel the price is $43. The price includes the tour bus, general admission, and a private Highlights tour of the Museum. Lunch is not included, however there is a cafe on sight, and numerous recommended restaurants are within walking distance in Old City Philadelphia. The bus will leave the Raritan Twp. Municipal Building parking lot at 9am and return at approximately 4:30 pm. Tickets are available at the Municipal Building's Clerk's Office and also at Raritan Township Community Day on September 29th at Lenape Park. Contact Pete Kinsella or Kerry Rhea at 797-3291 and 806-7116 respectively. The Tewksbury Historical Society will be holding its annual covered dish supper beginning at 5 pm, followed by Thomson’s illustrated lecture at 6:15 pm. Both the covered dish supper and lecture are free and open to the public, however for those attending the supper attendees are asked to bring a hot or cold casserole or salad or a dessert. The main course of ham and all refreshments will be provided by the Society. Reservations can be made for the supper by calling (908) 832-6734 or email the Historical Society and indicate your name and number in your party. Please reserve by Friday, Nov. 9. Thomson will present a broad overview of the so-called “Mountain Colony” and these many equestrian activities followed by the history of the Farmer’s Day races that have evolved into the Far Hills Race Meeting Steeplechase and the history and art of the four-in-hand road coaches that were owned by the area’s then wealthy landowners. D&R DELUXE BUS TOUR, THE POLITICS AND PAIN BEHIND ROUND VALLEY RESERVOIR AND MORE! THE END OF THE YEAR IS APPROACHING AND "WATER, WATER EVERYWHERE" IS GOING OUT WITH A FLOOD OF TRULY FASCINATING TALKS AND A COMPELLING TOUR! SUNDAY, NOVEMBER 18TH: AN AFTERNOON AT THE MOVIES: TWO SHOWINGS!! "THE TOWN THAT DISAPPEARED OVERNIGHT": Join us as we bring back this Emmy Award nominated documentary about the creation of Round Valley Reservoir and the taking of some of the best agricultural land by the State of NJ. The film's producers, David Kuznicki and Eric Althoff, along with County Historian Stephanie Stevens will be on hand to answer questions. Main Branch of the County Library. Reservations required. Free with free Refreshments. The famous Haunted Village at the Red Mill Museum Village is back for its 28th season of scares! The ghouls are ready and waiting in our maze, terror trail, haunted hayride, vortex, and haunted Red Mill to terrify our visitors. You may just have to Run for Your Life to survive! The box office is open each night from 5pm to 10pm and the attraction opens after dark at approximately 7:00pm. Visit The Red Mill Haunted Village's website for ticketing and more information. Join us for the Lambertville Historical Society's autumn house tour -- in its 36th year! This is a self-guided walking tour with volunteers to help you at each tour site. Walking around Lambertville is involved and usually takes from 2-3 hours to do the entire tour. Visit Lambertville's spectacular historic homes and sites! We are proud of our town of approximately 4,000 residents, which is listed on both the State and National Registers of Historic Places. Lambertville’s architecture and history span more than two centuries. Enjoy visiting the homes and buildings open for this year’s tour, to stroll our streets, explore our shops, enjoy our wonderful restaurants, and experience the beauty of our Delaware River waterfront. 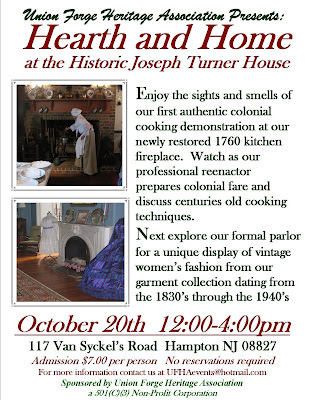 Suggested donation for tour is $5.00; tickets and tours begin HCHS Doric House, 114 Main St., Flemington. Proceeds go to the local food pantry.